It seems movie makers have been inspired by our bookshelves lately and that’s not a bad thing. No debate from me that the book usually takes the cake over the movie but, based on their trailers, I think these will translate to the big screen quite well. If it’s not in the theatre quite yet, it will be soon. I admit, I started off as a reluctant reader of this book when it was selected for book club but ended up enjoying it immensely. The movie looks like just as much pure designer-dressed family saga fun. One of Ian McEwan’s (of Atonement book and movie fame) more recent books. This looks awfully compelling! Was impressed by Emily Mortimer in The Newsroom series. Here she is nestled among books and huge stars, Patricia Clarkson and Bill Nighy. I’ve already seen this one (it’s new to Netflix) and it’s lovely, heartwarming entertainment. Can’t wait! Ann Patchett’s Bel Canto remains one of my favourite stories of all time. So many of Nick Hornby’s novels have appeared on screen and this is the latest. Lots of Brit Lit it seems! Share your reviews … book or movie. Just another gem from Humans of New York. In a week with headlines dominated by misbehaviour and wavering values, it seemed like a good time to think back on some solid sense. 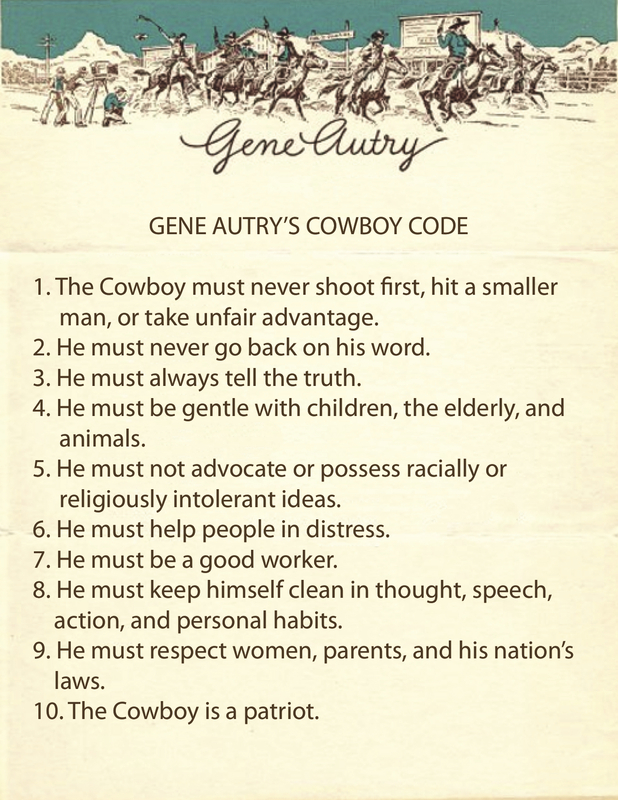 Gene Autry would be celebrating his 107th birthday in a week’s time but I think his code is still relevant today. 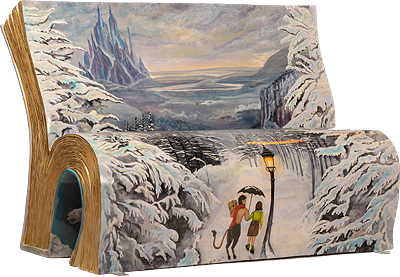 Wouldn’t you love to perch upon one of these literarily-themed benches? If you’re visiting London, England this summer you can indeed take a seat. In fact, you’ll have a choice from among fifty benches positioned throughout the city. 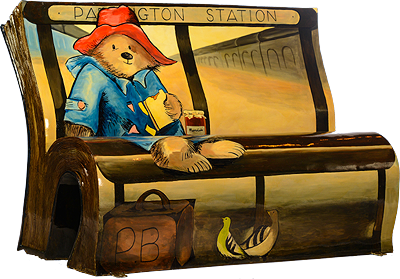 The benches will be auctioned off for the benefit of the National Literacy Trust in October 2014. This special event was planned to “celebrate reading for enjoyment” and, in so doing, also show off some of the wonderful artistic talent and strong literary heritage of the city. To read more about this endeavour and to get a glimpse of all the benches, click here. I think visiting the benches in person or even just pictorially will inspire us all to pick up an old, favourite read. Have you been able to guess the titles represented above? 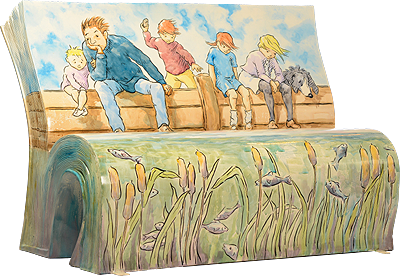 Four different Books About Town Book Bench trails have been established: The Bloomsbury, The City, Greenwich, and Riverside. Relevant literary works in bench form have been positioned along each path. If you would like to vicariously travel a route, then visit one of the map pages. Sometimes I struggle to select a blog post topic, usually due to an excess rather than a dearth of ideas. And sometimes, like today, a most wonderful subject simply lands in my in-box! After reading the e-mail message (from my boys’ high school English teacher) and its contents, I was reminded of my own high school English teachers and their roles in inspiring my interest in, and love for, engaging with the written word. I imagine many of you share a similar experience. What an influential role those teachers have! 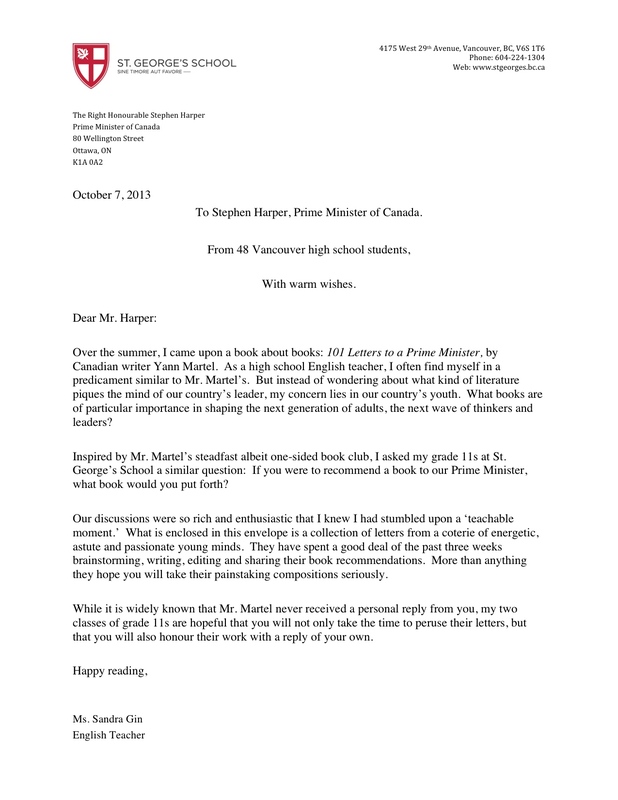 Over the summer, I came upon a book about books: 101 Letters to a Prime Minister, by Canadian writer Yann Martel. As a high school English teacher, I often find myself in a predicament similar to Mr. Martel’s but instead of wondering about what kind of literature piques the mind of our country’s leader, my concern lies in our country’s youth. What books are of particular importance in shaping the next generation of adults, the next wave of thinkers and leaders? 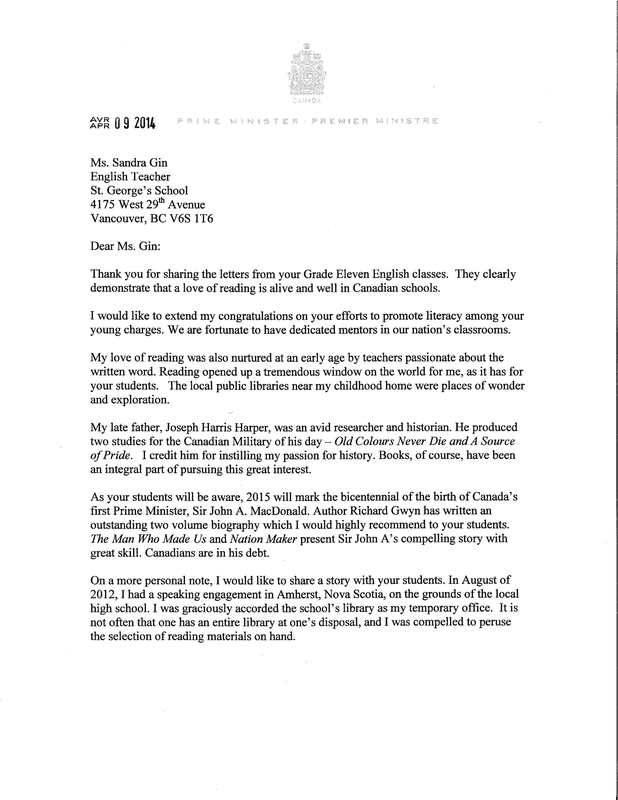 Inspired by Mr. Martel’s steadfast, albeit, one-sided book club, I asked my grade 11s at St. George’s School a similar question: If you were to recommend a book to our Prime Minister, what book would you put forth? Our discussions were so rich and enthusiastic that I knew I had stumbled upon a “teachable moment.” What is enclosed in this envelope is a collection of letters from a coterie of energetic, astute and passionate young minds. They have spent a good deal of the past three weeks brainstorming, writing, editing, and sharing their book recommendations. More than anything they hope you will take their painstaking compositions seriously. 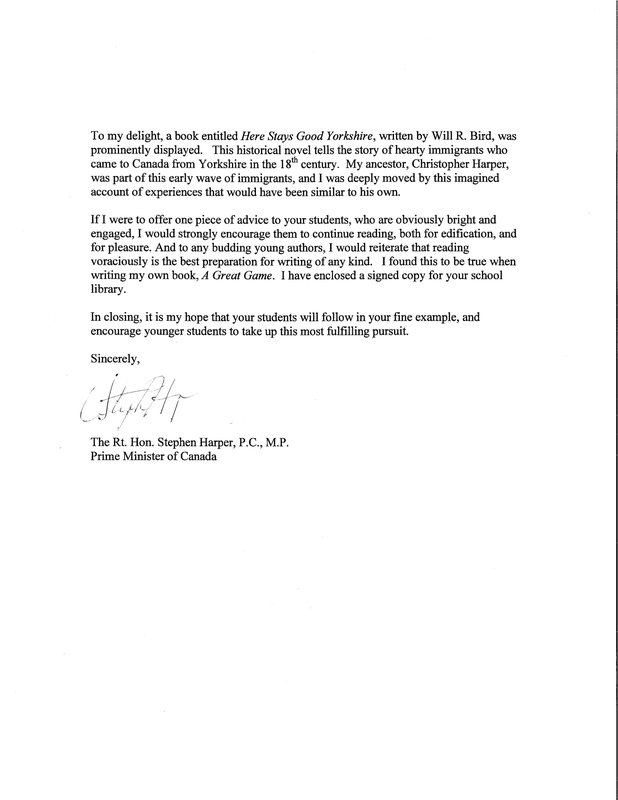 While it is widely known that Mr. Martel never received a personal reply from you, my two classes of grade 11s are hopeful that you will not only take the time to peruse their letters, but that you will also honour their work with a reply of your own. Thank you for sharing the letters from your Grade Eleven English classes. They clearly demonstrate that a love of reading is alive and well in Canadian schools. I would like to extend my congratulations on your efforts to promote literacy among your young charges. We are fortunate to have dedicated mentors in our nation’s classrooms. My love of reading was also nurtured at an early age by teachers passionate about the written word. Reading opened up a tremendous window on the world for me, as it has for your students. The local public libraries near my childhood home were places of wonder and exploration. 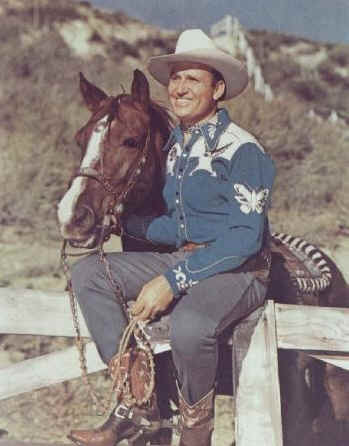 My late father, Joseph Harris Harper, was an avid researcher and historian. He produced two studies for the Canadian Military of his day – “Old Colours Never Die” and “A Source of Pride”. I credit him for instilling my passion for history. 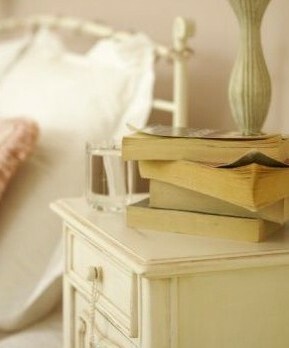 Books, of course, have been an integral part of pursuing this great interest. As your students will be aware, 2015 will mark the bicentennial of the birth of Canada’s first Prime Minister, Sir John A. MacDonald. Author Richard Gwyn has written an outstanding two volume biography which I would highly recommend to your students. The Man Who Made Us and Nation Maker present Sir John A’s compelling story with great skill. Canadians are in his debt. On a more personal note, I would like to share a story with your students. In August of 2012, I had a speaking engagement in Amherst, Nova Scotia, on the grounds of the local high school. I was graciously accorded the school’s library as my temporary office. It is not often that one has an entire library at one’s disposal, and I was compelled to peruse the selection of reading materials on hand. To my delight, a book entitled Here Stays Good Yorkshire, written by Will R. Bird, was prominently displayed. This historical novel tells the story of hearty immigrants who came to Canada from Yorkshire in the 18th century. My ancestor, Christopher Harper, was part of this early wave of immigrants, and I was deeply moved by this imagined account of experiences that would have been similar to his own. If I were to offer one piece of advice to your students, who are obviously bright and engaged, I would strongly encourage them to continue reading, both for edification, and for pleasure. And to any budding young authors, I would reiterate that reading voraciously is the best preparation for writing of any kind. I found this to be true when writing my own book, A Great Game. I have enclosed a signed copy for your school library. In closing, it is my hope that your students will follow in your fine example, and encourage younger students to take up this most fulfilling pursuit. Quizzes have long been a source of social entertainment, from parlour games in the times of Marcel Proust and Oscar Wilde to present day airport lounge diversions in the pages of Cosmo. One, long-standing in popularity, has come to be known as the Proust Questionnaire and is determined to honestly reveal the character traits and interests of its participant. Though the questionnaire takes the name of Marcel Proust, he was an enthusiastic and witty test-taker rather than the actual creator. The Proust Questionnaire has come to be used in modern times by a number of talk show hosts, famously by James Lipton of Inside the Actors Studio who asks each guest to complete an adapted version at the end of his or her interview. CBC Radio’s The Next Chapter also poses a few of the questions to its guest Writers. Since 1993, the last page of each issue of Vanity Fair magazine has been devoted to The Proust Questionnaire featuring a different celebrity’s responses each time. The best of these pages were collected into a book by VF editor Graydon Carter. 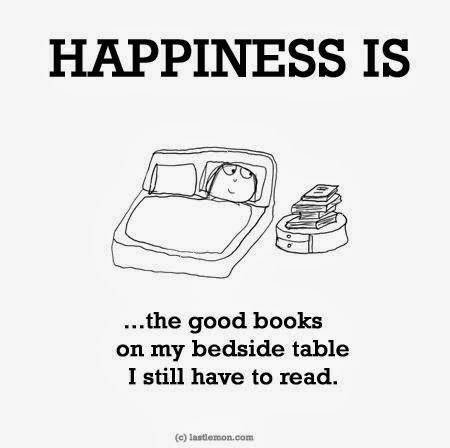 Great reading entertainment! You can also link to the magazine’s Proust page here and read a few samples. So are you intrigued enough now to want to answer your own Proust Questionnaire? Here it is! I’m so giddy about this discovery that I am pirouetting about in search of where to even begin (I am actually ‘pivoting’ but pirouetting sounds more like what a Parisienne would do!) I recently discovered the engaging work of Canadian-living-in-Paris, Janice MacLeod, and couldn’t wait to tell you all about her and her art, and her letters, and her book … As I sit here playing with phrases to aptly capture her charming allure, I am realizing her very own words will best give you a sense of her playfulness and the guaranteed fun ahead when you read her letters and book. I just know you are going to be reading her letters and book! “After a childhood in Canada that was just dysfunctional enough to make me funny, I became an advertising copywriter and eventually an associate creative director. Most of my time was spent in top agencies throughout the USA and Canada, because I’m kinda into fame. And modesty. I’m humble, too. And perfect. So, you can enrol to receive a single masterpiece, or a 6-month subscription, or a full year of 12 treasures! (I know, I know, my mental math is mind blowing) To do so, visit Janice’s Etsy shop, as above, or by clicking here. Just imagine the delight of finding Paris in your postbox and what an impressive wall display you could have! Hooked already? Wait! There’s more. You see, there’s a love story afoot too. 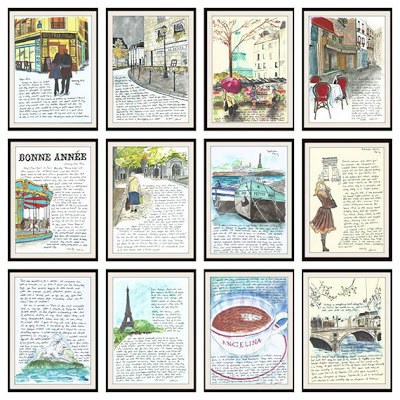 (Mais bien sur) Paris Letters – One Woman’s Journey from the Fast lane to a Slow Stroll in Paris is Janice’s story behind how she came to start her letter writing endeavour and the Amour who motivated her to find a way to stay in Paris. It’s an inspiring tale of making dreams come true. So if you’re not packing up for a trip to Paris over Spring Break, and heck, even if you are, this enchanting read will bring you joy. What book has the most romantic significance for you? I promised I’d write when I’d finished your book, Cinnamon Toast at the End of the World. Your web scouting let you know it was featured on my summer reading list and you were curious, as I imagine every writer must be, to learn how your work would be received. Lots of pressure for both of us there! What if I’d promised, and then abhorred the book? What if I couldn’t finish it, even? Fortunately, neither of those scenarios applies. ‘Oh, Stephen, for God’s sake, it’s not the end of the world,’ my mother will say, over and over, in tones of sympathy or distraction. Or sometimes plain impatience. You had me, right there. Fantastic! This Stephen seemed a bit of a scamp and I wanted to get to know him. As an ’85 Grad myself, the promise of a nostalgic tour through the era in his company seemed inviting too … So Writer, I purchased your book. In this modern era, a quick trip to the author’s website is often a worthy venture. Sometimes, you’ll find out she/he is a wit, a charmer, friendly to fans … and sometimes, not so much. You, Ms. Cameron, come across as the former: personable and fantastically fun. And thoughtful too – an 80’s music soundtrack to accompany a reader is kindly provided on your site along with photos of the setting’s inspiration. As I merrily started in, it soon became clear that this journey was going deeper than a mere trip to the beach. I won’t expose the tale but let’s just say as I compulsively turned pages, my heart broke and then was pieced back together with optimism and then out loud laughter (OLL?) – repeatedly; tears ran down my cheeks on several occasions. You took me so convincingly to small town Nova Scotia and the era with wonderfully evocative details like a “Welcome to Town” sign with a “Thanks for Visiting” message on the reverse and a Grandmother sporting those crocheted slippers with the pom poms on the toes. I am astonished by your compelling ability to write from the perspective of a teenaged boy – an awkward, tormented teenaged boy. Frankly, I wouldn’t normally be drawn to a character exhibiting tormented traits and you might have lost me (especially as I had toast at the beach in mind) but you imbued him with the most lovely optimistic spirit despite his situation in life. He’s a character who will linger with me. Beyond Stephen, the story illuminates the importance of family, whatever it may look like, and friends, whatever they may look like. Vital values indeed. One reviewer declared this “an important book” and I couldn’t agree more. All the best to you, Janet. Do hope you are happily writing your way through a lovely summer!